My brother recently got me hooked on growing my own sprouts. Now that I’ve discovered how easy it is, I grow them all the time. If you enjoy eating sprouts, but you hate buying them only to have them wilt and wither in your fridge, then you should give this a try. I promise you, it’s very easy. Homegrown sprouts are better for you than the store bought variety because they’re grown without using any soil. Sprouts grown in soil run the risk of containing harmful bacteria like E. coli and salmonella, but when you’re not using soil, you don’t have to worry about getting sick. 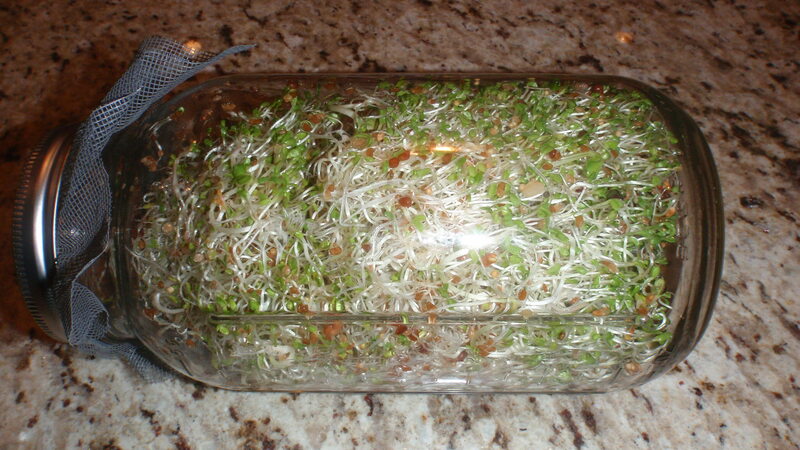 Homegrown sprouts are also very cheap to grow. You can buy a bag of sprouting seeds for under $10 dollars and even if you grow them continuously, the bag will last you awhile. And, of course, homegrown sprouts are guaranteed to be fresh and delicious because you can pop them into your sandwich or salad the very second they’re big enough to eat. 2. Place the square piece of mesh over the mouth of the jar and tighten the metal ring from your jar lid over the top. You now have a screen to keep your seeds inside the jar. 3. 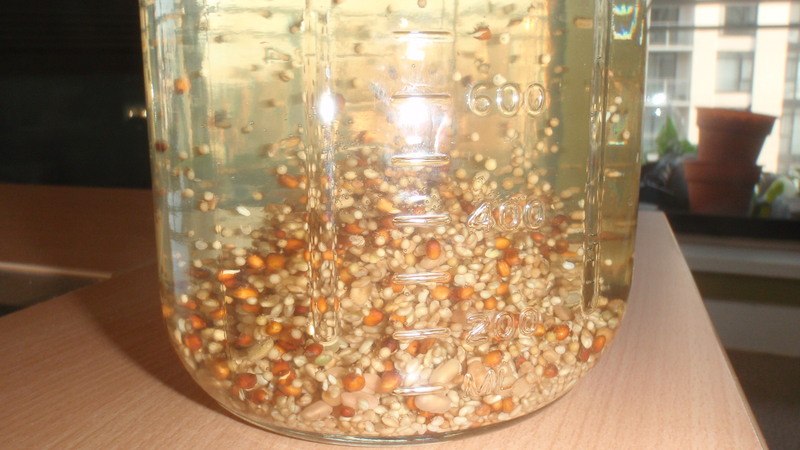 Fill the jar up with room-temperature water and swirl the seeds around inside. 5. Fill the jar up again with water, but do not dump the water out. Leave the jar to rest like this for at least 12 hours, or overnight, to give the seeds a good soaking. 6. After 12 hours has passed, swirl the jar of seeds around again and dump the water into the sink. 7. Re-fill and then rinse the seeds a few more times with room-temperature tap water until you’re satisfied that they’re clean. 8. 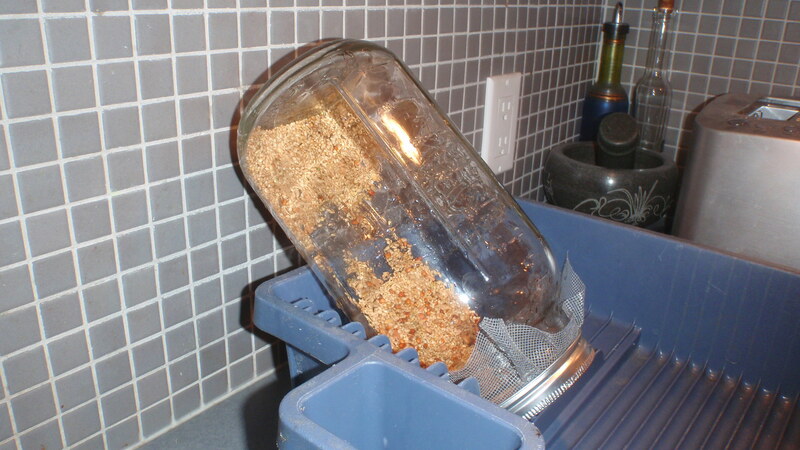 Now, invert the jar so the mesh screen is on the bottom, and rest it on an angle on your dish rack. 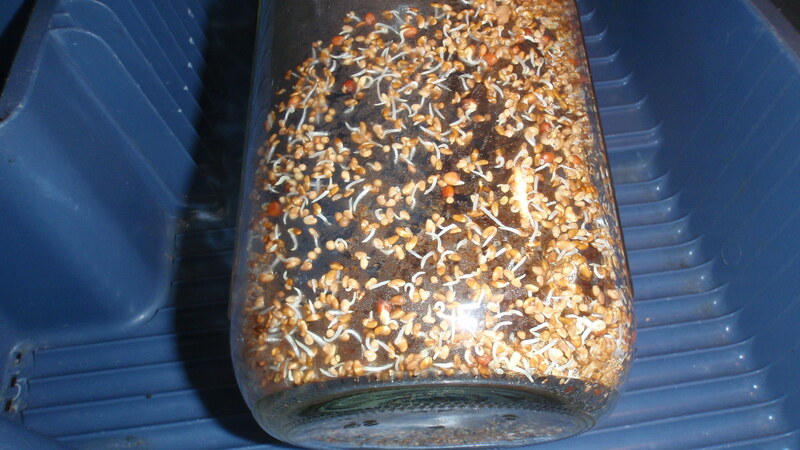 The excess water will drip out the bottom and your seeds will begin to germinate in their own little greenhouse. 9. For the next three days, rinse the jar of seeds in the same manner at least twice a day, leaving them inverted after each rinsing. You can rinse them more if you want, it really doesn’t matter. Just pay attention to them periodically and make sure they remain hydrated. In between rinses, condensation will build up on the inside of the jar. This is a good thing. 10. The seeds will usually begin to sprout after the first full day. You will notice the seed casings splitting open with little, white roots sticking out. 11. 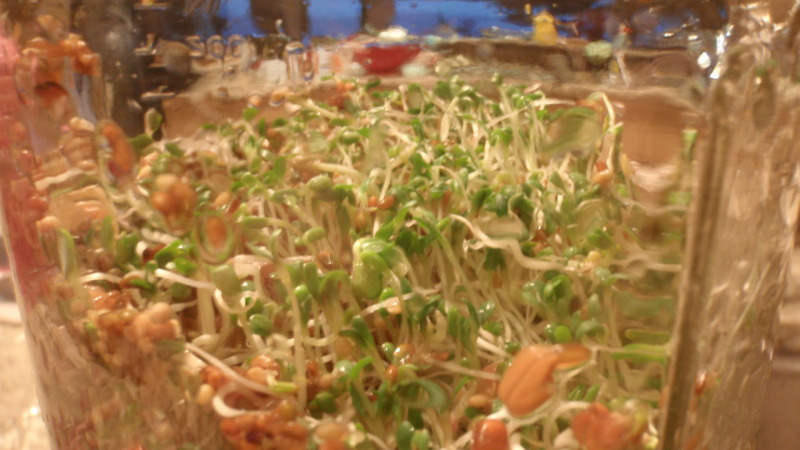 You will be surprised at how fast your sprouts become fully formed. Mine are usually ready on the third or fourth day. Once they’re between one to two inches long with their first two baby leaves at the end, they’re ready. 12. To turn your sprouts nice and green, place the jar on a sunny windowsill for a few hours. Try to rotate the jar at least once. Once the sprouts are fully formed and green you can store them in the fridge for about a week, sometimes longer. But… don’t forget about them in your fridge! Try and remember to rinse them every now and again to keep them fresh and crisp. This may seem like a lot of steps but really the basic principle is to rinse them a couple of times a day until they’re ready. 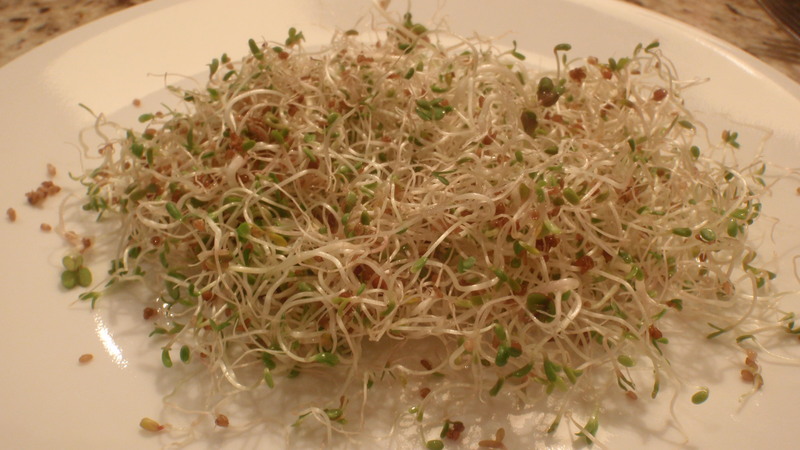 Sprouts are delicious in sandwiches, salads, stir fry’s and even soups. Sometimes in a pinch, I eat them in forkfuls directly from the jar. However you decide to eat them, just remember to give them a good rinse first. You can buy sprouting seed mixes at gardening stores or in some grocery stores, but I order mine online from West Coast Seeds. I grow a mixed variety called the Go Go Blend that contains organic alfalfa, red clover, radish, mustard and fenugreek seeds, but there are many other options out there too. Good luck, and happy sprouting!